Staying organized is one of the most important things that you can do as a family caregiver to ensure that your aging parent is getting the care, support, and assistance that they need while also allowing you to fulfill your other obligations and responsibilities efficiently and with as little stress as possible. While there are many tools that you can use to help you accomplish this, one of the most effective and beneficial is the calendar. 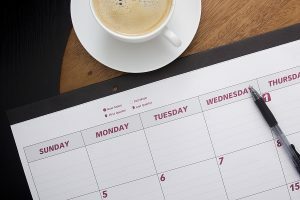 A large calendar that is readily visible in the home, not on your phone or other device, is a highly effective way to keep your schedule organized and under control, and help you to visualize what you need to do and when so that you can make sure that is done in the way that is best for everyone involved. Use color-coding to make it easier to quickly recognize the importance of a task and who it involves. When putting tasks and obligations on the calendar, first put those that are fixed and inflexible, such as birthdays, holidays, anniversaries, set appointments, and school events. This ensures that these are recognized and everything else must work around them. Make sure that you add in time for yourself. When it is on the calendar, you will treat it like the obligation that it should be and ensure that you do not book other things that will overtake that time. This helps to reduce your stress and ensure that you are taking proper care of yourself at all times. Try to schedule tasks so that you can minimize running back and forth. Try to fit in everything that is happening around the same area together to streamline effort. Once you have filled in your week or month, evaluate your calendar to determine when you may need help, such as additional elderly care for your parent or a sitter for your children. Be sure to update this calendar if anything changes rather than thinking that you will remember or only using your mobile device. If your parent has been struggling with challenges and needs such as limited mobility or a chronic health issue, now may be the ideal time for you to consider starting elderly care for them. An elderly home care services provider can be with your aging parent on a fully customized schedule that is designed to ensure your parent has access to all of the care that they need, while also keeping you at the forefront of their care routine. This care provider can fill care gaps and step in to help your parent manage their needs and challenges in the ways that are best for them according to their personality, individuality, thoughts, preferences, and goals. As their family caregiver this can give you peace of mind knowing that both when you are with them and when you are not, your parent will have what they need to live a lifestyle that is as independent and fulfilling as possible. If you or an aging loved one are considering elderly care in Marlboro, NJ, please contact the caring staff at Lares Home Care 888-492-3538 or 732-566-1112.